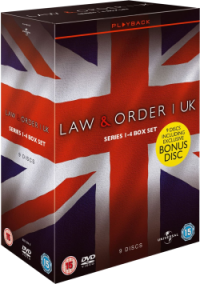 ITV’s crime drama broadcast from the very begining comprising of 2 disc for every series up until series 4, plus an addition disc with unseen footage. Starring Bradley Walsh (CORONATION STREET), Freema Agyeman (DOCTOR WHO), Jamie Bamber, Ben Daniels and Harriet Walter. The same extras found on each series DVD set, plus a further disc of 45 minutes unseen footage. Includes Interview with Freema Agyeman, Ben Daniels, Bill Paterson and Harriet Walter. On set with Jamie Bamber and Bradley Walsh. Tour with Freema Agyeman. Interview with Nazir Afzal OBE (real life Head of CPS). Interview with Producer Richard Stokes. This title was released on July 11, 2011.